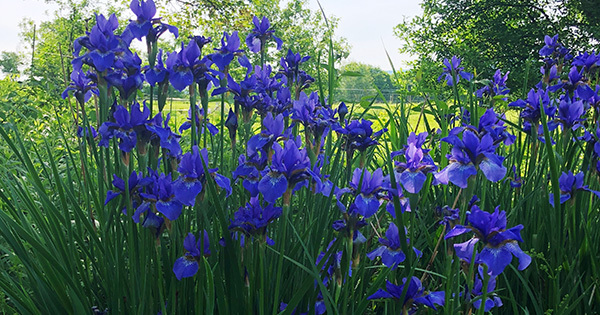 It is early June here in the north western Catskills, the Dean’s iris have come into full bloom. They form beautiful deep purple clumps by the gates and fringe the western edge of the pond. They assure us that spring is truly here and that summer is short to follow. They are true signs of the promise of shifting seasons, not like the fickle promise of flowers in that cruelest month of April. We know them as The Dean’s iris because, many years ago now, they were given to us by the former dean of the seminary I attended as I prepared for ministry in the Episcopal Church. Felicitously, his name was, Rose. Dean Rose, was, in every sense a man of the old school, literally from another century. As chance or providence would have it, he was born only 30 or so miles from where I write, just this side of the turn of the 20th century. He served the seminary I attended with determined faithfulness and a generally dour expression. It wasn’t that he was actually all that severe, he just looked as though he was. During my entire three years in seminary I believe I only spoke to the Dean, one on one, perhaps half a dozen or fewer times, and that with a total student body of few more than a hundred. Though slight of build he was an awesome figure, even viewed from a safe remove, which students (and perhaps, who knows, faculty) preferred. Through complications too convoluted to relate, in his retirement, during the first years of my ordained ministry, my family and I had occasion to visit him at his home in rural Connecticut. There I discovered what an interesting, charming, remarkably whimsical man he truly was. Our children followed him around his little farm like he was the proverbial pied piper. In fact one time he showed them how, at just the right time of year, you could make a whistle out of the bark of a freshly cut tree shoot simply by cutting the shoot into the desired length and then slipping the bark off whole. (Sadly I no longer remember the plant itself.) It was during one of those long ago visits that he dug up and gave us a clump of iris. We planted them in front of our little cabin in the mountains. Over the years the cabin has been modified and expanded to become our home. Each time we have expanded we have preserved the iris. We split them and replanted all around our home. And here they are still blooming year after year, lavishly and unselfconsciously bathing us in beauty. And every year when this annual offering of beauty returns, I think once again of The Dean. A simple gift of flowers, how seemingly inconsequential, out of a lifetime of giving. And yet here they are. They are not the sum of a lifetime of living and giving, but they are a sign, a reminder of a life well lived. My pleasure in them is deeply enriched by my memory of him, but does not depend on that memory. Without that memory I would still be moved by the splendor of their annual self-offering. It is, after all, their beauty that is before my eyes, not his. But how fortunate I am that vision and memory have become so intertwined. For me this stands as a simple reminder that the things that we do live after us destined ultimately to be caught up in the Good that is the Divine Will.